Is there a mesh generator that will generate zero thickness elements for interfaces? I have a geometry and a finite element method where there are a couple internal interfaces across which I want to enforce some fairly simple jump conditions. The idea is to do XFEM to account for the interface conditions, and generating zero thickness elements seems like the simplest way to implement it. Gmsh (http://geuz.org/gmsh/) will do it for you. Simply create all of the volumes, surfaces, and lines that are required to describe the geometry and interfaces. Then, assign a "physical" id to everything that you want meshed. Once you mesh the geometry, everything to which you have assigned a physical ID will be meshed. The "zero thickness" elements will simply be 2D elements (tri/quad) in a 3d mesh or line elements in a 2D mesh. Gmsh feels a bit clunky at first, but once you get the hang of using the interface or writing input files manually, it can be a very easy way to generate unstructured meshes. Below, I have pasted a simple input file that generates a square with a diagonal line interface. To use this in gmsh, copy the below text into a file with a .geo extension (doesn't matter, this is convention). Then (in Linux) from the command line, run "gmsh -2 (your file name).geo". This will create (your file name).msh in the same directory. To visualize the mesh, run "gmsh (your file name).msh". Running gmsh on the .geo file will display the geometry, but not the mesh. Not the answer you're looking for? Browse other questions tagged finite-element mesh-generation unstructured-mesh or ask your own question. Recommendations on FEM software for implementing Nitsche's method on interfaces between matching meshes? 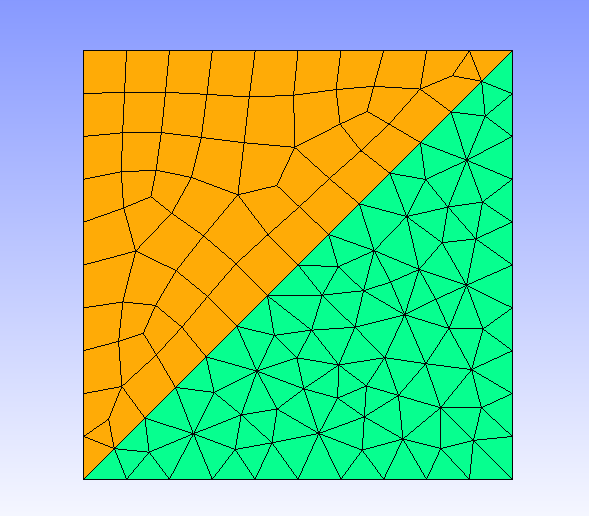 Is there a bound on the number of edges, facets, and elements in a 3D simplicial mesh in terms of the number of mesh nodes? Mesh generator that can do 2D & 3D elements combined?